From almost sleet-like rain a few weeks ago to days of soaring temperatures of over 40 degrees Celsius; this is Melbourne, Australia. 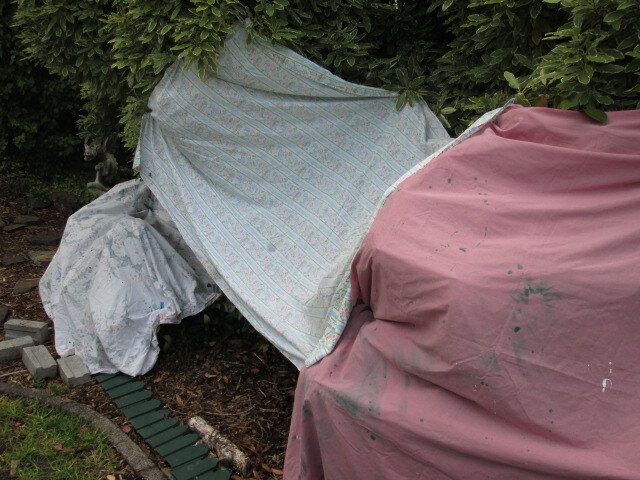 Suffering severely, the garden struggles to cope, aided by diligent watering. Some plants really show their displeasure with the heat. 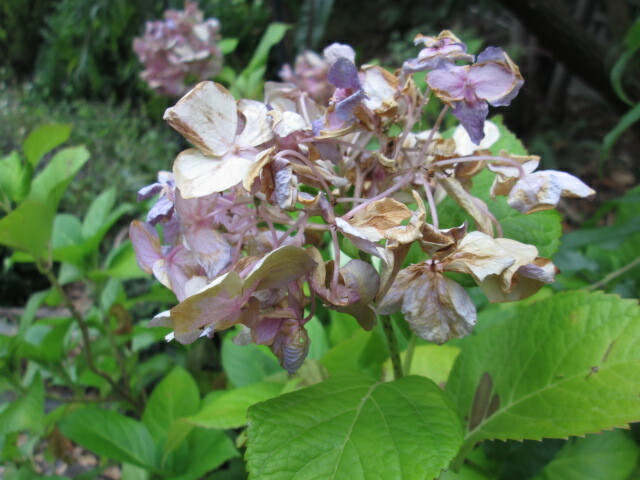 The hydrangea wilts sadly but sparks up after being watered. 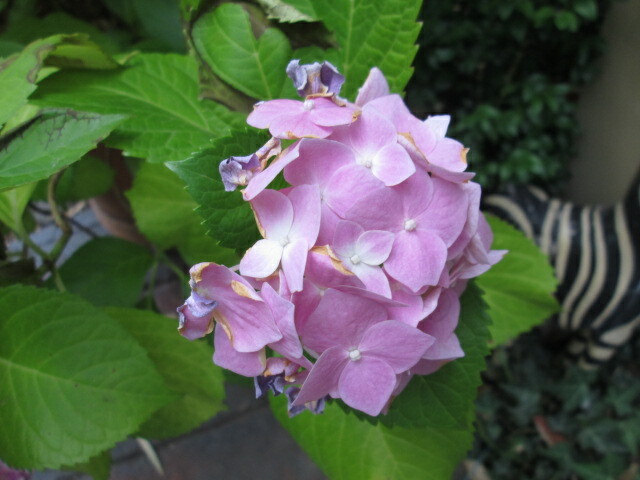 The heat has taken its toll on most of the flowers, though a few still look okay. 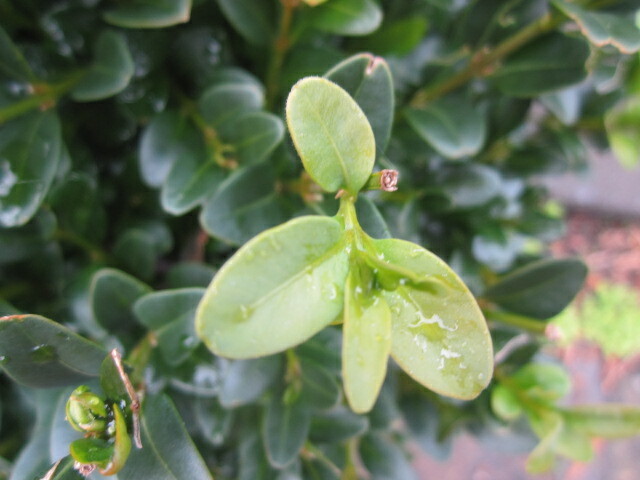 It is very evident that a few plants are not in positions suitable to their needs. 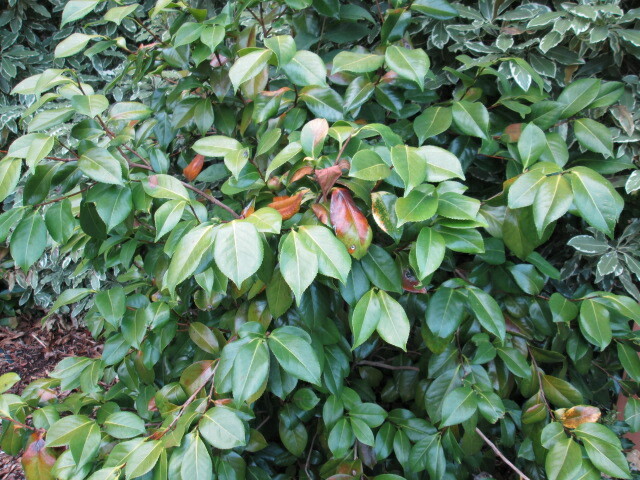 For example, the smaller purple rhododendron and white camellia on the eastern side of the back garden’s middle tier, are not as protected from the western hot afternoon sun since we had the conifers lopped eighteen months ago. 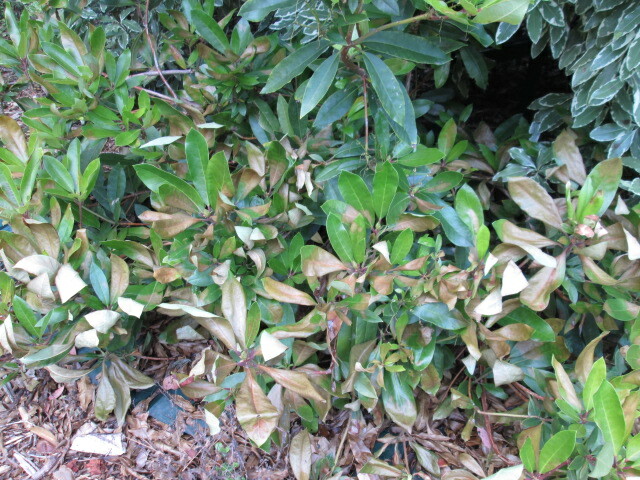 Sadly, before I thought to protect the leaves with painting drop sheets, the sun had already attacked the leaves, particularly of the rhododendron. Although not a very glamorous look, hopefully it will prevent further deterioration. 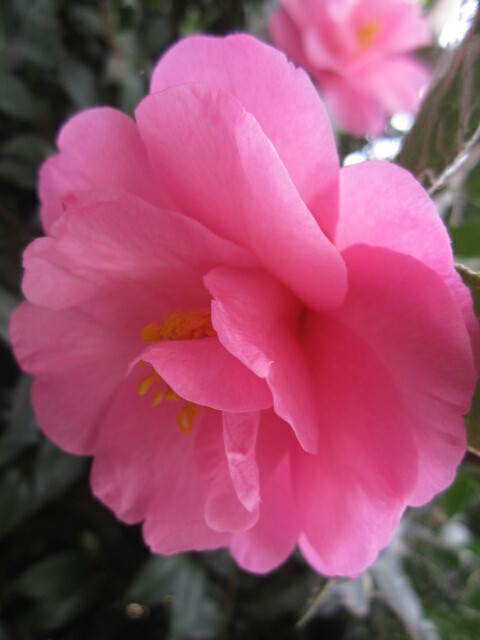 A mass of pink camellias abound on the eastern wall of our house. Though desperately in need of a prune, while they are flowering with such glory and abundance I am loath to attack them with the secateurs. Let them have their day, I say. 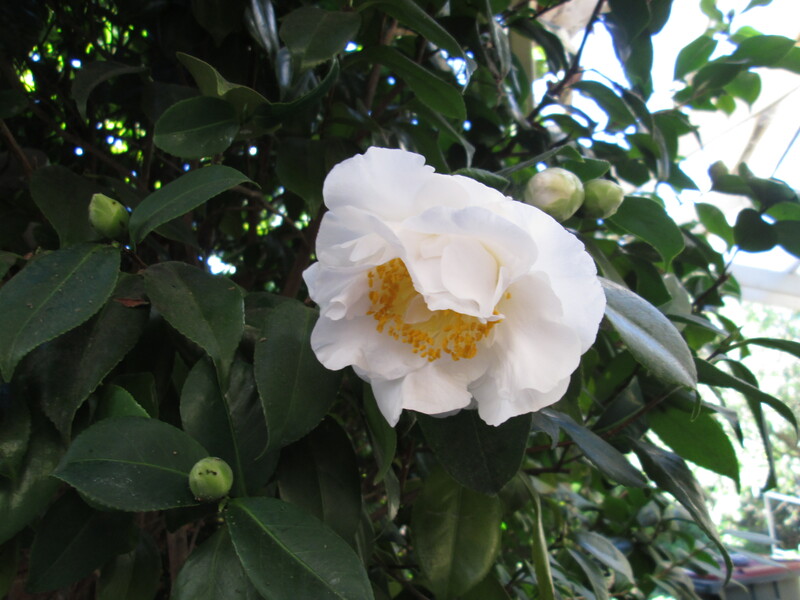 Last year I posted about the sneaky camellia. Each year I smile again to recall that story. 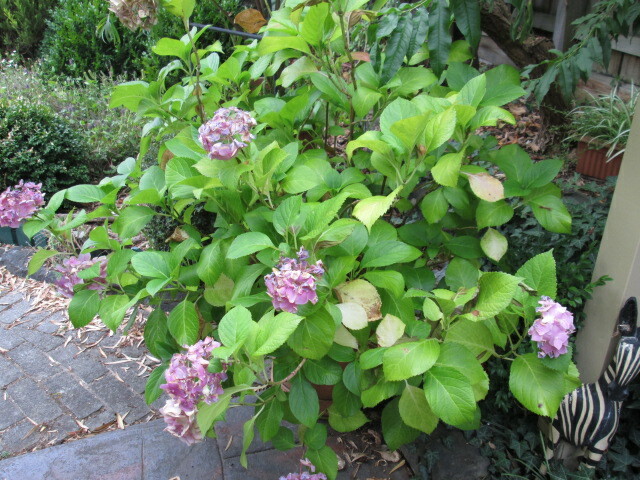 It’s still going strong after all these years, and I have to admit to not even fertilising the poor plant at all this year. I love having a number of self-sufficient plants in my garden. 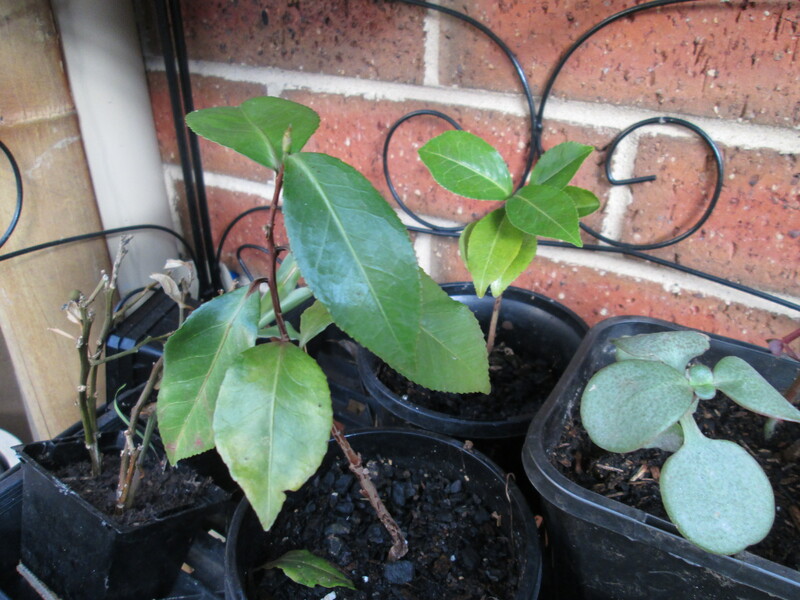 I also love the fact that I found a couple of baby camellias growing under the main plant, which I have potted up. The search shall soon be undertaken for a new home for the offspring. What do I have in common with the next two photos? 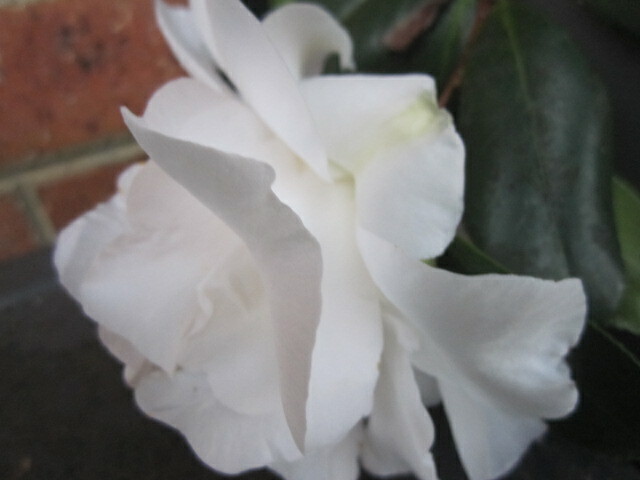 Whilst the flowers are budding camellias, I am a budding author. Is author too strong a word for a blogger? Does one have to be professional (as in earning money from writing), to be termed an author? I would love to know what you think. 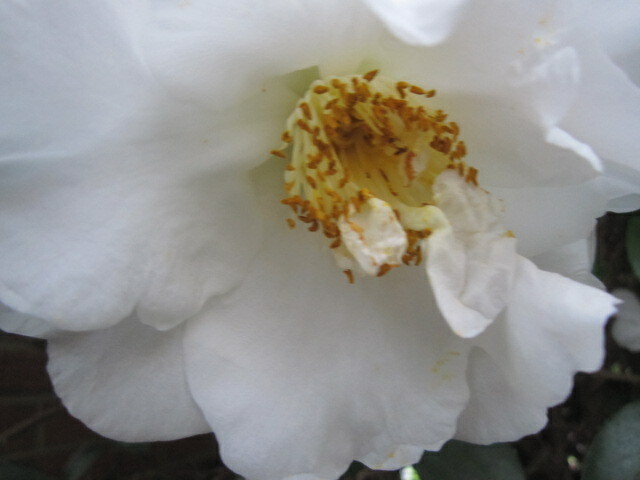 This one reminds me of a fried egg, with its white outer and yolky inner. Thank you for the underline on yolky. I know it’s not a real word. It’s a jokey. 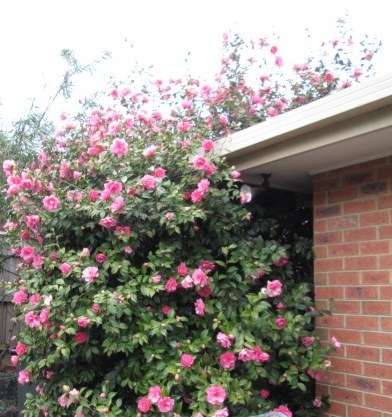 Camellias flowers are lovely but they do brown fairly easily, and in my opinion are not the best cut flowers because they drop quite quickly. 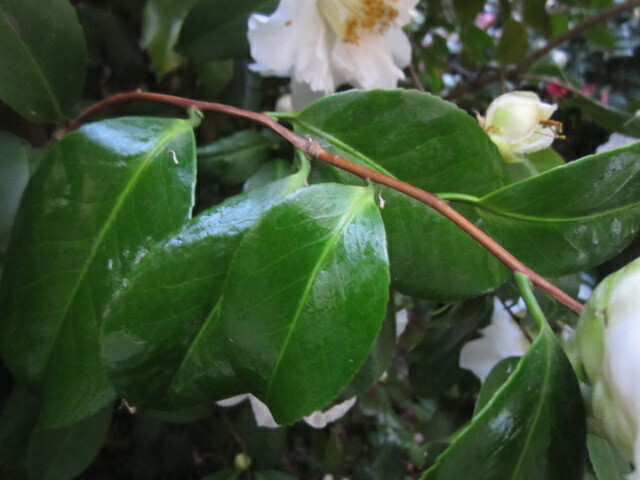 Out in the garden under the camellia there is an array of discarded blooms. 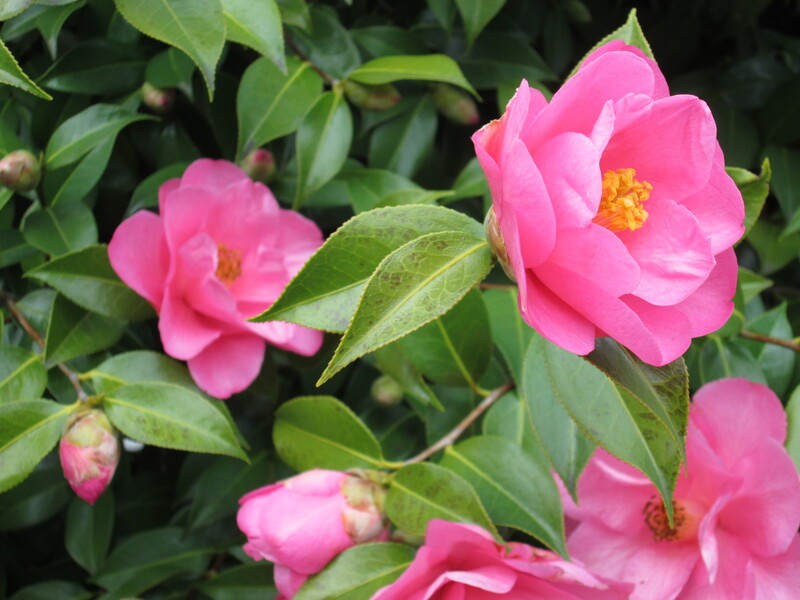 The pink one is particularly pretty because it tricked us, so we call it the sneaky camellia. A delicate little spiderweb drapes itself from the dark green foliage onto the flower. 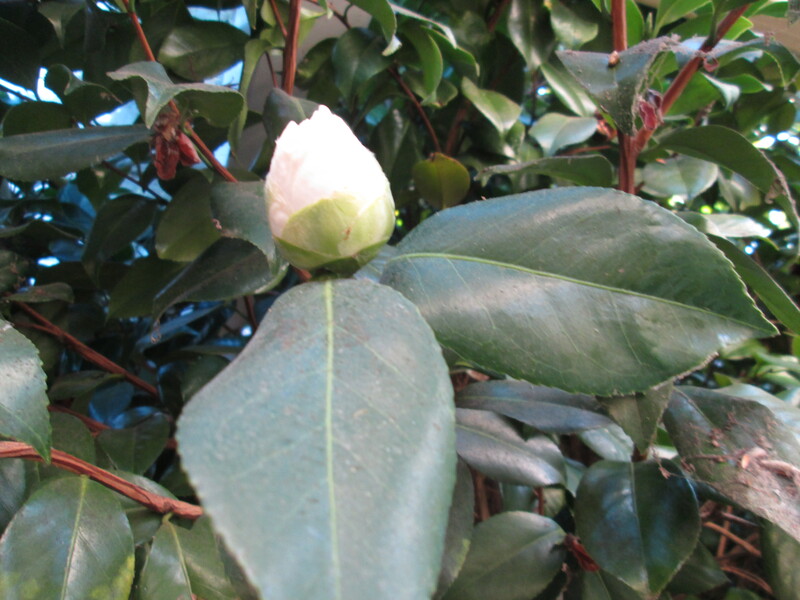 The sneaky camellia, so named because it flowered pink instead of white, has given birth! 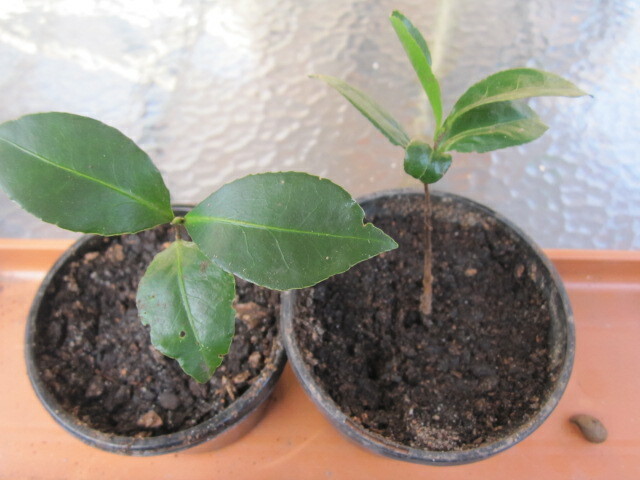 Underneath the large camellia I found two small plants, which I have potted, so that later I may find a new spot in the garden for them. 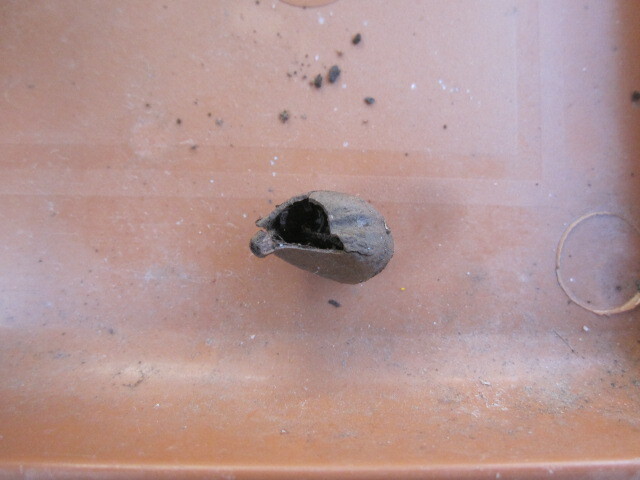 Attached to one of these plants was a little seed pod. 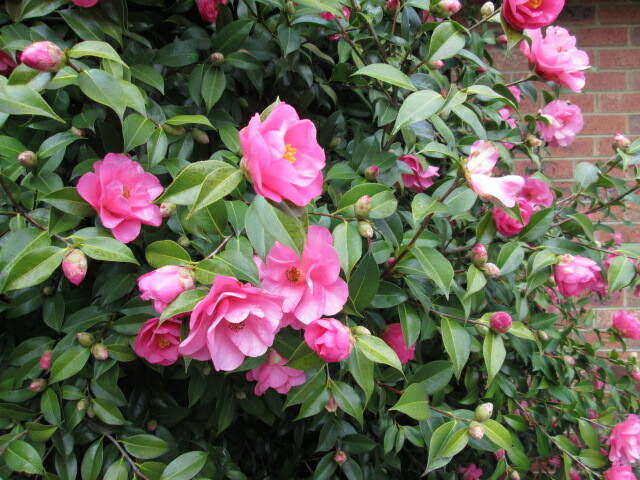 It will be interesting to see if they are successful, and also what colour the flowers might be. 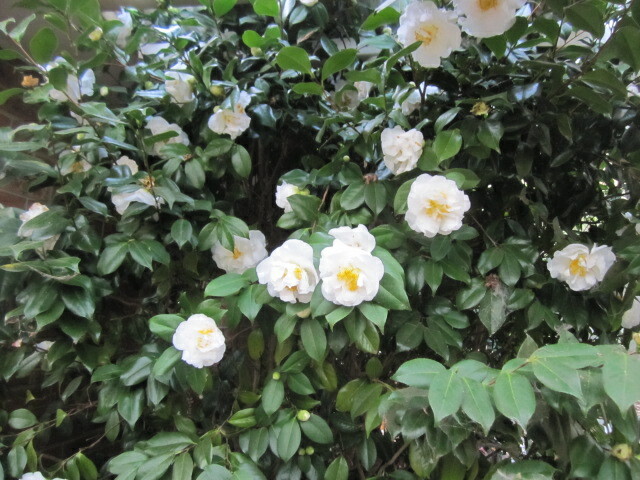 What a wonderful mass of camellias we have this year. The conditions must be exceptional, as I don’t remember having so many flowers in previous years. That could have something to do with the drought of 2009, and its aftermath? This is my personal theory, which may or may not be right. I have a cap that states “Everyone is entitled to my opinion” and it is an epithet I tend to live by! 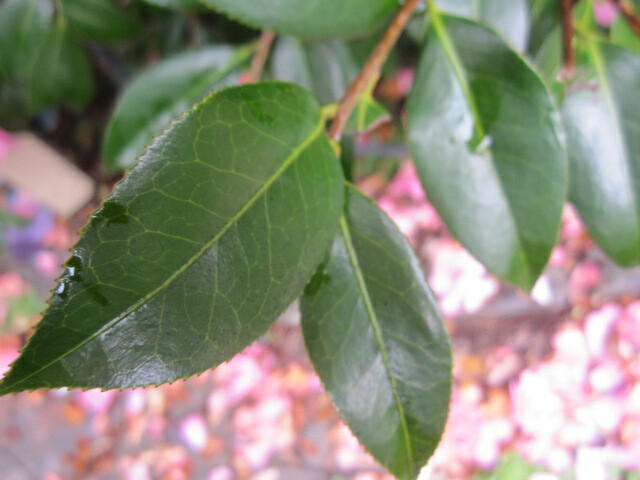 I’m sure those leaves didn’t look dusty or diseased when I took that photo less than an hour ago. I’m going back outside to check out those leaves. Stay tuned! …Okay, I’m back. Those leaves do look a bit dusty, but I remember the flash went off when I took that first photo, which shows up that film of grime. The flash can be a little harsh. The above photo was taken without the flash, which gives a gentler image. 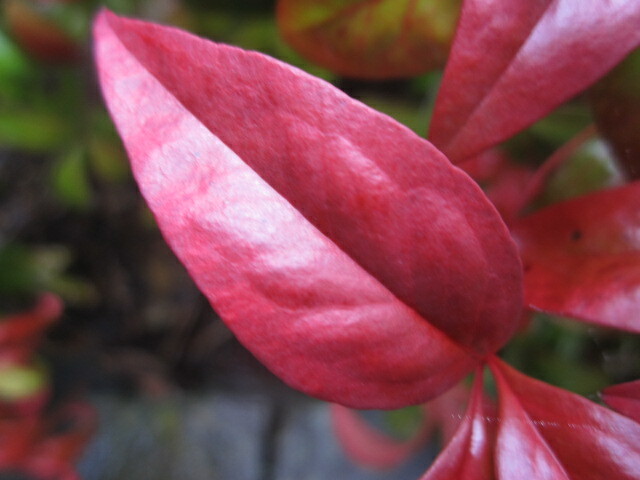 Then I tweaked the next one by wiping the leaves with a damp cloth to give them a glossier look. Hey, it’s no different from wearing makeup to enhance one’s appearance. 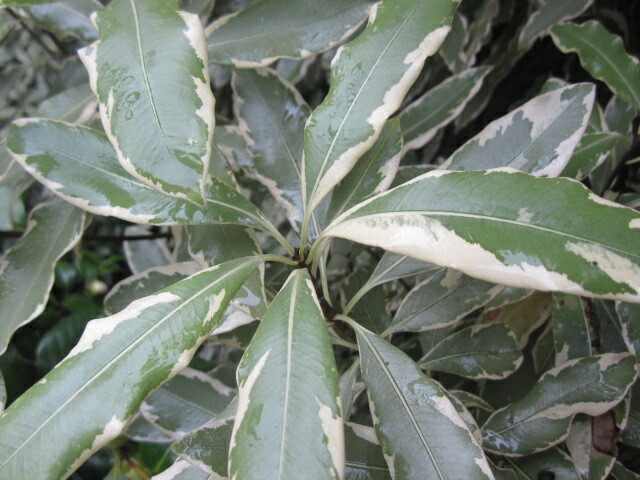 Greenery and leaves form an intrinsic part of any garden. 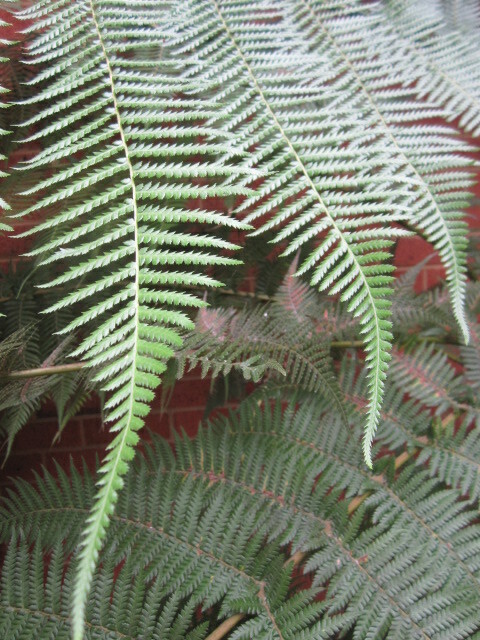 I love the way they come in so many different shapes, sizes and shades of green. 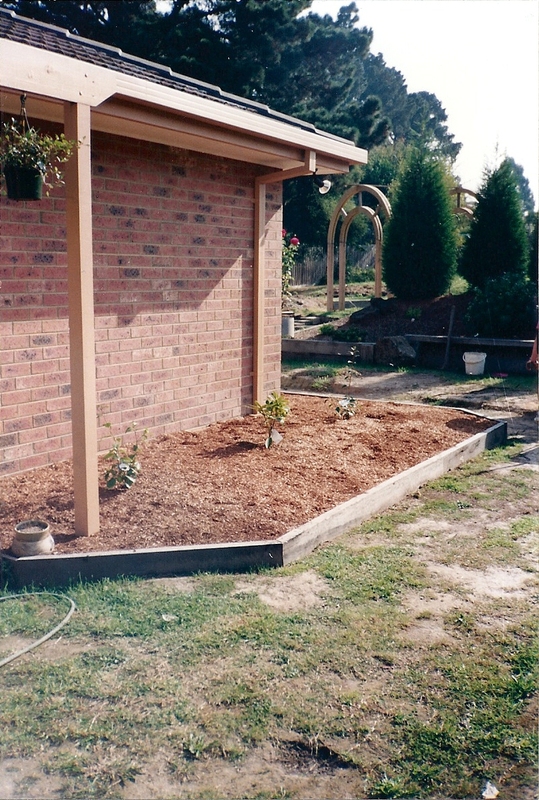 Back in the early 90’s it was fashionable to have an all-white garden. 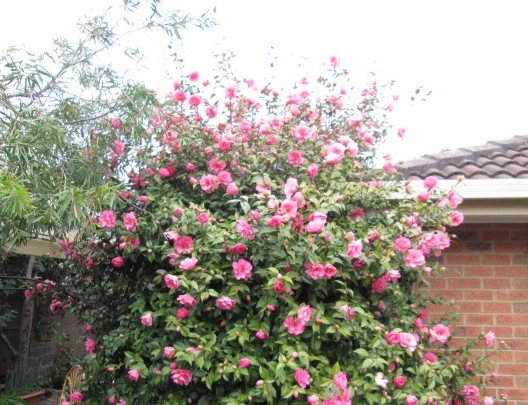 I remember later reading somewhere that Audrey Hepburn had a garden completely devoid of coloured blooms. We decided to have a small garden next to the extension with an all-white theme. 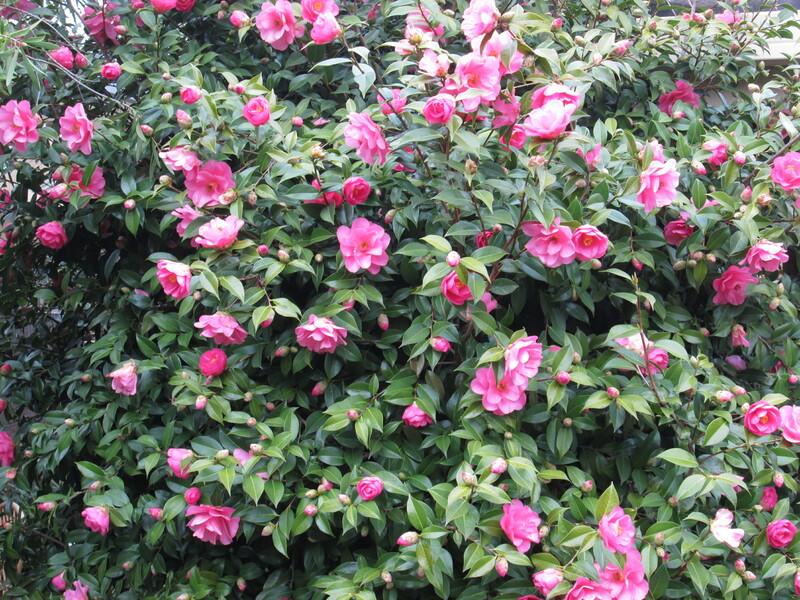 At least this time we allowed plenty of growing room for the three plants: one rhododendron in the centre, flanked by two white camellias. 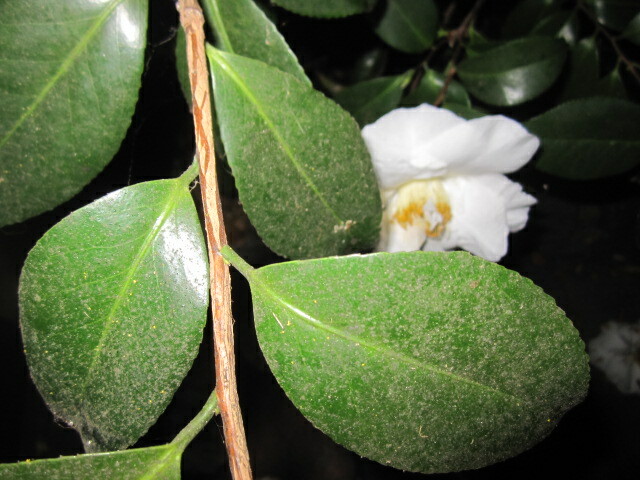 Here is a photo of the white camellia on the right. That’s not white, you say. 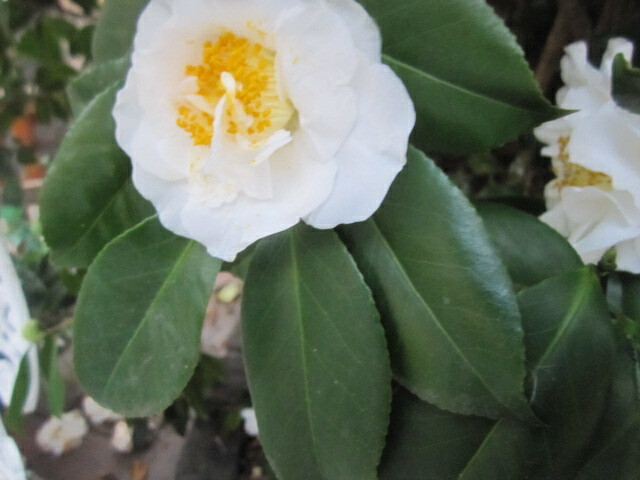 Yes, it turned out that the tag on the plant at the nursery had faded, making it look like it was a white camellia, when in fact it was pink. Fortunately, by the time it flowered I didn’t really mind it being coloured, as by then I could see the limitations of an all-white garden. 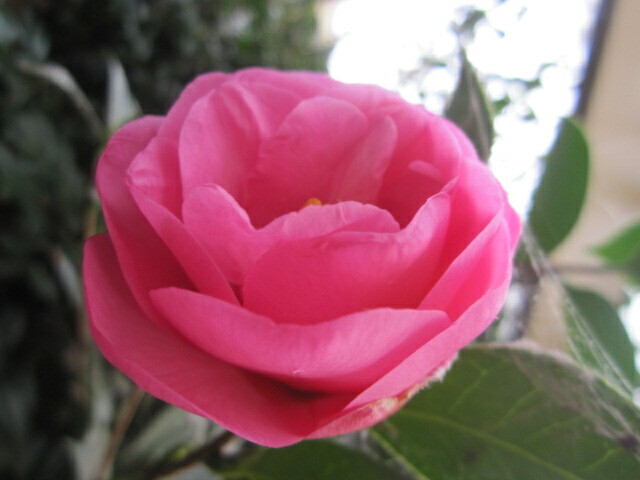 When it flowers, as it is at the moment, it always brings a smile to my face, as I remember how we were tricked by the sneaky camellia.